Universal Lever Assembly (for cables), cast. This includes all that is required to fit 7/8 inch (standard) bars. 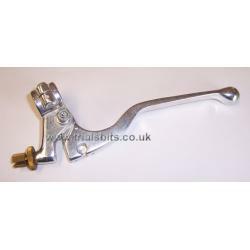 Available individually for both brake and clutch in long and short versions, choose from the drop down. The mounting screws on the clutch levers are black allen head, whereas the mounting screws on the brake levers are silver crosshead, also the short brake lever has a flattened end, rather than a ball end, so is not a very good match.